Rhinos grazing on the edge of Kruger National Park, 2016. 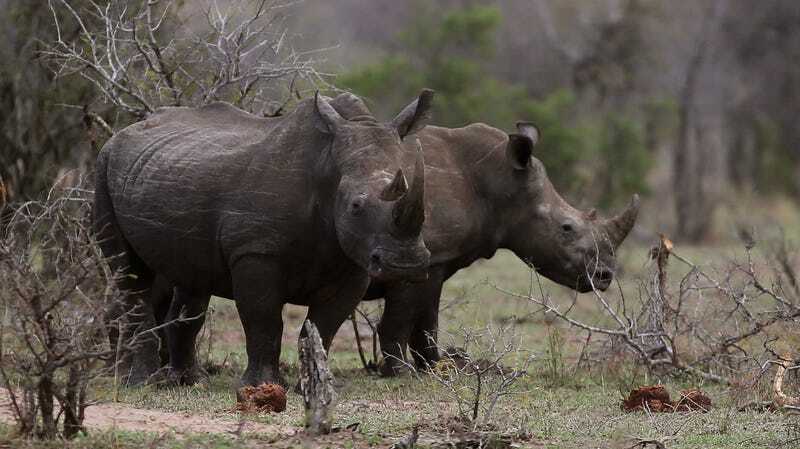 Kruger National Park, a highly protected zone guarded by everything from dogs to aircraft, says it is home to an estimated 349 to 465 of the critically endangered black rhino, which the IUCN Red List notes used to number in the hundreds of thousands of individuals. They now are believed to number at somewhere around 5,000, with almost all living in protected ranges in South Africa, Namibia, Zimbabwe and Kenya. CNN wrote that the park also says it is home between 6,600 and 7,800 white rhinos, which the IUCN Red List categorizes as Near Threatened and has a population of roughly 19,600 to 21,100 individuals concentrated in the same countries (though the northern subspecies is on the brink of extinction). Correction: Rhino horns are not ivory. We regret the error.